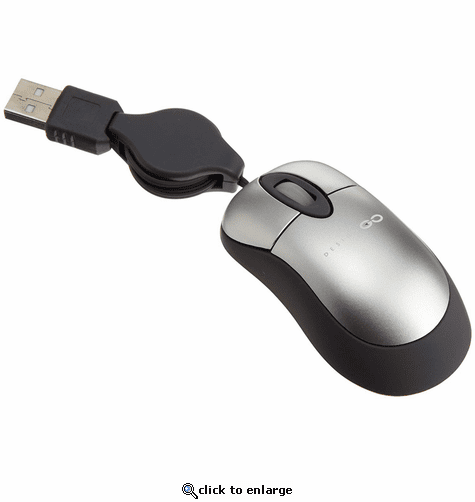 It's what Mighty Mouse was almost called, but we got there first with this travel-sized optical mouse. Plug into your USB port and you're click-happy for the rest of your journey. Miniature travel size optical mouse USB plug and play with PS/2 connector 3D scroll wheel Compatible with Microsoft 98/ME/2000/NT/XP & Apple mac OSx size: H75mm x W40mm x D25mm Composition = plastic / electrical. Established in 1978, 'Go' still remains a family owned business and it is just as committed to bring innovative products to market as it was nearly 30 years ago. In the beginning there were only 10 items in the range. Today, under its new branding 'Go Travel', over 250 products span a wide variety of consumer needs within the travel and gift market. The Go Travel product range can be found in over 18,000 locations across the UK and in over 45 countries around the world. With over 10 million units sold each year, the brand continues to strengthen across domestic and international borders. What is not commonly known is that the company pioneered the concept of a co-ordinated range of travel accessories. Its success has lead to healthy competition, spawning an entire industry within the world of travel which it still dominates to this very day. With 80 staff in the London HQ, the team offer a world class service to the retail trade and quality products at reasonable prices to the consumer.